Zane Lambert is in contention to write history as only the second three-time PBR Canada Champion. Photo by Covy Moore/CovyMoore.com. 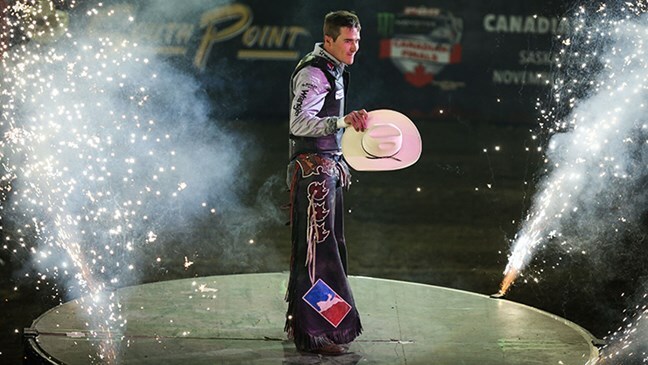 NEW YORK CITY – With the 2018 PBR Canada season more than halfway complete, reigning national champion Zane Lambert finds himself in familiar territory to where he sat last season prior to his march towards the Canadian title. For the second consecutive year, the 32-year-old rode his way to the Glen Keeley Memorial Bull Riding event title, positioning himself solidly in the Top 10 of the Canadian standings as both the Touring Pro Division and Monster Energy Tour begin the final slate of events prior to the 2018 PBR Canada Finals in Saskatoon on Nov. 23-24. “Yeah that was pretty cool to be able to win the Glen Keeley Memorial Bull Riding,” Lambert said. “It’s always one of the ones that’s the best of the year. The contractors bring their best bulls and it’s just one of the buildings where you always see high-scoring rides. “The first bull was good, he was better than I expected and had a good day and he fit me good,” Lambert said of his first round draw. “Thor [Hoefer II]rode him in Calgary the first time we rode him, but we bucked him in Lethbridge and he was the high-marked bull there for the two days we were in Lethbridge and kind of an up-and-comer we were watching for. “Yeah, that’s one of the bulls we were looking for all year,” Lambert said of Two Bit Bucking Bulls’ Happy Camper. “We were watching him and he’s a great solid bull that Two Bit has raised. He’s a great animal and he’s lasting too. For his efforts, Lambert earned $4,971, 320 Canadian and 60 world points. While Lambert didn’t split the win this season like he did with Parsonage last year, the win left him in similar standing as it did in 2017.